In 1928, Sir Alexander Fleming made an epoch making discovery at St.Mary’s Hospital, London, when he observed that a mould containing one of his cultures caused bacteria in its vicinity to perish. Since the mould belonged to the genus penicillium, Fleming named the antibacterial substance “penicillin”. In 1928, Sir Alexander Fleming (Fig 30.2) made an epoch making discovery at St.Mary’s Hospital, London, when he observed that a mould containing one of his cultures caused bacteria in its vicinity to perish. Since the mould belonged to the genus penicillium, Fleming named the antibacterial substance “penicillin”. Subsequent work by Florey, Chain, and Abraham at Oxford university led to the production of crude penicillin which was tested on patients with dramatic results. Penicillins are effective against infections caused by Strep­tococcus, Neisseria, Listeria, Proteus, E.coli, Pseudomonas, Enterobacter, Spirochaetes, and Klebsiella. Some of the peni-cillins are also active against Staphylococcus aureus. After absorption, parenteral penicillins are generally eliminated from the blood rapidly since the half-life is low (about 30 minutes). Therefore repository preparations have been devel-oped to prolong their presence in the blood: procaine penicillin G, and benzathine penicillin G. Probenecid which blocks the renal tubular secretion of penicillin can also be used for the same purpose. Excretion of penicillin is mainly through urine (10% by glomerular filtration, and 90% by tubular secretion). Non-renal elimination includes hepatic inactivation and to some extent excretion in the bile. The latter two means of inactivation and excretion respectively, assume the greater importance for all penicillins in patients with renal impairment. ■■ All penicillins contain 6-aminopenicillanic acid (6-APA), which is composed of a thiazolidine ring and a beta-lactam ring as a part of their chemical structure. Addition of various chains by acylation of the 6-amino group of 6-APA yields semi-synthetic penicillins, (e.g. amoxycillin, ampicillin, carbenicillin, cloxacillin, dicloxacillin, hetacillin, methi-cillin, nafcillin, oxacillin and phenethicillin). ■■ Penicillins and cephalosporines are together referred to as beta-lactam antibiotics,* and share the same mechanism of action, i.e. they inhibit the synthesis of bacterial peptido-glycan cell wall. Since there are several micro-organisms which produce beta-lactamase, the spectrum of activity of penicillins can be broadened by beta-lactamase inhibitors such as clavulanate. — methicillin, oxacillin, cloxacillin, dicloxacillin and nafcillin. · Hypersensitivity Reactions: Penicillins are the mostcommon agents implicated in drug allergy, (Table 30.3). In decreasing order of frequency, allergic reactions to penicillins include maculopapular rash, urticarial rash, fever, bronchospasm, vasculitis, serum sickness, exfolia-tive dermatitis, Stevens-Johnson syndrome, and anaphy-laxis. The most common adverse effects occurring after administration of intramuscular procaine penicillin G are the Hoigne syndrome and the Jarisch-Herxheimer reaction. Hypersensitivity reactions may occur with any type of penicillin, with any dosage, and with any mode of admin-istration, though generally the most severe reactions are observed with injection of procaine penicillin. The occur-rence of a reaction on one occasion does not necessarily imply repetition on subsequent exposures, though this is very likely to happen. On the other hand, hypersensitivity reactions can appear in the absence of a previous known exposure to the drug. Dermal manifestations of allergy are most commonly seen with ampicillin. · Anaphylaxis—It has been estimated that the over-allrisk for a serious anaphylactic reaction with penicillins is 2/100,000 (or 0.002%). The reaction results from the local and systemic release of endogenous vasoactive substances including leukotrienes C4 and D4, hista-mine, eosinophilic chemotactic factor, and vasoactive substances such as bradykinin, kallikrein, prostaglandin D2, and platelet-activating factor. Local cutaneous reaction (> 15 cm). IV. Airway type—asthma, swelling of tongue, dysphagia, laryngeal oedema. Cardiovasculartype—hypotension, cardiovascular collapse. -- Adrenaline: 0.01 ml / kg (upto 0.5 ml) of 1: 1000 solution, subcutaneously, every 15 minutes. -- Oxygen: 40 to 100 %. -- Beta2-adrenergic stimulants: preferably by nebulisation (0.3 to 0.5 ml in 2.5 ml of 0.9% NaCl). -- Corticosteroids: preferably methylprednisolone 125 to 250 mg, 6th hourly, for 2 to 4 doses. -- Antihistamines: preferably diphenhydramine (1 mg/kg). -- Aminophylline: 6 mg/kg , IV infusion. -- IV fluids: 10 to 30 ml/kg (titrated to effect). -- Activated charcoal: 1 gm/kg (if reaction has occurred to oral penicillin). · Jarisch-Herxheimer Reaction—Abut 70 to 90% ofpatients with secondary syphilis suffer this self-limited reaction when penicillin is administered. It begins several hours after injection of the first dose and is characterised by fever, chills, headache, myalgia, and arthralgia. Cutaneous syphilitic lesions may become more prominent. The pathogenesis of this reaction is believed to be an acute antigen response to lysed bacteria. Treatment involves administration of aspirin. Penicillin therapy should be continued as the reaction does not recur after the first dose. · Hoigne Syndrome—It is invariably associated withinjection of procaine penicillin and is more common in males. It has also occurred with oral administra-tion of amoxycillin. Main features include anxiety, fear, illusions, hallucinations, tachycardia, hyperten-sion, vertigo, tinnitus, abnormal taste, neuromuscular twitching, confusion, agitation, depression, and seizures. The cause is unknown, though it is generally attributed to a sudden increase in free procaine levels in the CNS, and also postulated by some to be related to microemboli formed from penicillin G procaine crystals. Onset is immediate, and may last for up to 60 minutes. · Orally administered penicillins can alter the composition of microflora by eliminating sensitive micro-organisms, which can result in superinfection by resistant microbes. 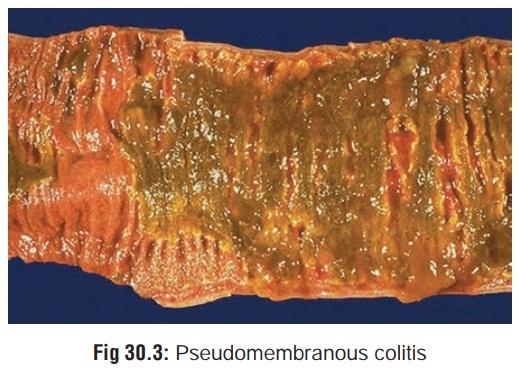 Occasionally, pseudomembranous colitis may develop due to overgrowth and production of toxin by Clostridium difficile. There is formation of a pseudo-membrane on the mucosa of the colon (Fig 30.3) with diarrhoea (mixed with blood and mucus), abdominal cramps, fever and leucocytosis. Treatment involves immediate cessation of penicillin and administration of vancomycin or metronidazole. · Diarrhoea, nausea, vomiting, and abdominal pain often occur. · Cardiac conduction defects have occurred following rapid IV administration of potassium penicillin G. Cardiorespiratory arrest may follow procaine penicillin G administration. · Drowsiness, myoclonus, seizures, and coma may occur following IV administration of large doses of penicil-lins. Neurological side effects may be more common in patients with impaired renal function. Seizures may occur in very-low-birth-weight (VLBW) neonates (neonates weighing less than 750 grams) who receive ampicillin at doses of 25 to 100 mg/kg/dose every 8 to 12 hours. Other factors in these patients that may contribute to the development of seizures include renal impairment and increased permeability of the blood-brain barrier. · Hepatotoxicity, including elevated liver enzymes, cholestatic hepatitis, granulomatous hepatitis, and acute vanishing bile duct syndrome, may occur. · Renal failure, crystalluria, interstitial nephritis, and haemorrhagic cystitis have been reported following the use of penicillin derivatives. · Electrolyte imbalances may occur when large doses of potassium or sodium penicillin G or carbenicillin disodium are administered intravenously. · Thrombocytopenia, neutropenia, and agranulocytosis have been reported following administration of the semi-synthetic penicillins. · Dermatologic reactions vary greatly in severity, char-acter, and distribution. Amoxycillin and ampicillin appear to cause skin rashes more frequently than other penicillins. · Overdose with penicillins is rare and almost never life-threatening. Manifestations include nausea, vomiting, diarrhoea, and occasionally electrolyte abnormalities. · Large intravenous doses of penicillins can produce convul-sions due to interaction with picrotoxin-binding site on gamma amino butyric acid (GABA), which results in the inhibition of GABA from binding to its receptor. This causes a lack of inhibitory tone giving rise to seizures. Treatment involves the use of benzodiazepines and barbi-turates. · Intrathecal injection of penicillin G may produce arach-noiditis or severe encephalopathy. Intravenous administra-tion often results in phlebitis and thrombophlebitis. · Accidental injection of penicillin into sciatic nerve during deep intramuscular administration of the drug in the region of the buttock can cause severe pain and nerve dysfunction which can persist for weeks. · Overdoses of oxacillin and nafcillin have been reported to result in hepatitis. · Chronic toxicity with penicillins can manifest as bone marrow suppression, interstitial nephritis, vasculitis, and cholestatic hepatitis. Methicillin in the long run may induce corneal damage. Ampicillin has been reported to aggravate weakness in myasthenia gravis. · Urinalysis should be monitored following very large doses of penicillins, or when such drugs are used in large doses for prolonged periods of time. · There are limited data regarding the acutely toxic amount of penicillin. The minimum oral amount reported in the litera-ture to produce systemic effects is 11 times the maximum daily therapeutic dose (574 mg/kg). Toxicity is unlikely with doses of 250 mg/kg or less. Patients without a history of penicillin allergy and with ingestion of small to moderate doses of penicillin can almost always be managed at home. Patients ingesting large doses of penicillin (e.g. over 15 times the usual single therapeutic dose or over 250 mg/kg of amoxycillin) should probably receive gastric decontamina-tion and should definitely be evaluated in a hospital. · Gastric decontamination is rarely indicated but may be considered following an extremely large overdose of ingested penicillin. · Manage seizures in the usual manner with benzodiazepines or barbiturates. CSF penicillin levels greater than 8 units (5 mcg/ml) could result in seizures. · Haemodialysis: In severe overdosage where increased absorption may have occurred and there exists severe renal impairment, dialysis may be considered for correc-tion of acidosis and electrolytes, rather than for removal of penicillins. Combined charcoal haemoperfusion and haemodialysis has been effective in removal of penicillin in a few cases.